Delete any "MyWebSeach" extensions under menu TOOLS and then ADD-ONS and EXTENSIONS. 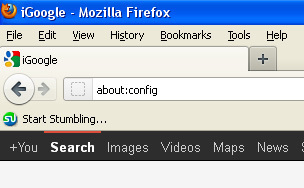 Next, in the address bar, type "about:config" without the quotation marks. You will see a warning about voiding your warranty. Click "I'll be careful, I promise!" and move on. In the filter bar, type "myweb." Right click any items that have "mywebseach" in them and select the "reset" option. I do not know much about MyWebSearch except that it block pages that have anything to do with "Removing Mywebsearch." If it is blocking those pages, it can block other information as well. Jerks. This worked when nothing else would. 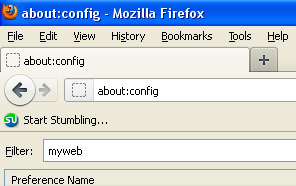 I removed all traces of myweb stuff from the registry, from the extension folder, and using the about:config command, from Mozilla. However, the damn thing still showed up on the quick search! I clicked on the quick search box, opened "manage search engines" and deleted Mywebsearch, and that seemed to solve the problem. What a nuisance! I have tried for 4 days to remove that blasted MyWebSearch, and nothing worked until your website came up. Thank you for your assistance - you ought to get a medal and the MyWebSearch-people a swift kick in the pants!